Spring brings life back to our deciduous trees, and the delicate unfolding leaves are beautiful, no matter what the tree. But the most beautiful of all are undoubtedly the new leaves of Japanese Maples. As spring turns into summer, the leaves expand fully, and again, in Japanese Maples their form and coloring make them stand out. When fall rolls round, it is Japanese Maples that we most often admire, and even in winter the delicacy of their branches is charming. Of all the trees in our gardens, none are more beautiful – or more diverse – than these trees, whatever form they take. The most remarkable thing about Japanese Maples is their diversity. From tiny, slow-growing bushes that are ‘instant bonsai’, to large trees 30 feet tall, the range of sizes available is enormous. You can furnish every level of your garden with them, from small shrubs to shade trees. No only do they vary in height, they vary in habit too. Some are upright, like most other trees, while some are broad and spreading. A very popular group of forms have pendulous branches, which can be simply arching, or completely pendulous, hanging vertically unless staked to give some height. Others are irregular, with tufted clusters of branches. Coral Bark Japanese Maple – ‘Sango-kaku’ – a beautiful upright tree reaching 25 feet in time, with bright-red twigs in winter. A classic tree of outstanding quality. Tamukeyama Japanese Maple – a cascading form, spreading widely with pendulous branches. Fast growing for this group, reaching 8 feet tall and 10 feet wide in a relatively time. Purple leaf color in spring and summer, fiery red and orange in fall. Lions Head Japanese Maple – ‘Shishigashira’ – a unique tree reaching 7 feet tall and 5 feet wide, and ultimately perhaps reaching 12 feet. Upright, but with dense, tufted shoots giving a very different look. Ideal for a tree in an elegant large pot. One of the most popular features of Japanese Maples is the coloring of their leaves. Leaf color can, and usually does, vary between spring, early summer, late summer and fall. Spring colors are often delicate, featuring pinks and pale greens. In summer purple leaf forms are popular, and the best keep that color all summer, without fading to dark green. Fall is almost always a fireworks display, with colors varying from gold to reds, oranges and purples – sometimes all on the same tree. 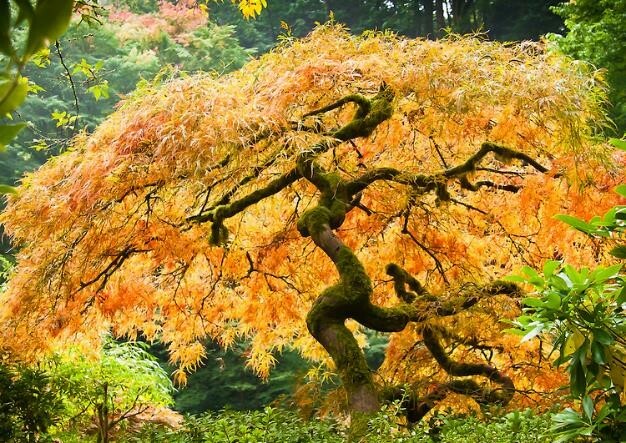 Butterfly Japanese Maple – a small tree reaching possibly 12 feet tall in time, and 8 feet wide, but usually smaller. This tree is renowned for its unique foliage. The soft-green leaves are edged in white, which is brushed with pink on newly-opening spring leaves. The irregular white edges brighten a partially-shaded corner of the garden in summer, and in fall they take on brilliant tones of scarlet and magenta, ending the season with a color explosion. Always bright and eye-catching, this variety is a real conversation piece. Fernleaf Full-Moon Japanese Maple – ‘Aconitifolium’ – this tree, growing 8 to 10 feet tall, and the same across, is a great choice for smaller gardens, and those in colder areas too, since it is hardier than most other types of Japanese Maple. It has fuller, more rounded leaves, and their bigger surface is a palette for some of the most spectacular fall coloring of any tree. No room for a sugar maple? Never mind, grow this tree instead – its colors are just as spectacular. In early fall the green leaves turn glowing gold, then as it becomes colder red spreads from the upper leaves first, across the tree until it is completely crimson – a remarkable sight, and worth repeating every year. Red Dragon Japanese Maple – there are many forms of Japanese maple with red leaves. It is the most popular variation, and yet trees often disappoint, by turning dirty green all summer, and having mediocre coloring in fall. So a long-standing goal of growers has been a tree with durable red foliage. With Red Dragon the goal has been scored. This tree starts in spring with cherry red unfolding leaves that will amaze you. They gradually turn to burgundy, and hold that color, without greening, all summer long. Then in fall they turn shades of crimson in a spectacular farewell. Unbeatable! This tree is also very sun tolerant, and indeed has the best colors in sunshine, so its ideal if you don’t have the partial shade favored by many other varieties. From far away we notice the overall form, and the leaf colors, of Japanese maples. On closer inspection we see the delicate leaves, which are also very variable in form. The basic leaf form of the usual Japanese maple, Acer palmatum, is like a hand, with long lobes starting at least in the middle of the leaf, if not deeper. These vary from 5 to 11 in number, with smaller ones on the outside and the longest one in the center. The edges of the leaf, all along the lobes, is serrated into small teeth. However there are many, many variations on this basic form, usually involving lobes cut more deeply, often almost to the leaf stalk, and elongated serrations, which make the lobes look jagged and lace-like. The lobes too can be broad or narrow. Sometimes the narrowest forms are described as a variety, ‘dissectum’, but with all sort of gradations of form, most experts today ignore this name. Generally, forms with the narrowest, most lacy leaves can be tricky to grow through the summer. A little drought, or a hot, drying wind, can cause the leaves to shrivel and brown. This can be disappointing, but when it happens later in summer it does little harm to the tree, since growth has more or less stopped by then for the season. It does end any chance of fall color, but many people consider their beauty in spring and early summer to be worth the price – and perhaps it is! Kiyohime Japanese Maple – when we think of leaf form, we often think of lacy leaves, but this lovely miniature tree has the opposite – bold almost star-shaped leaves, with just 5 pointed lobes and pronounced, sharp tips. They stand out on the tree, giving it a strong presence. This densely-branched tree grows just a few feet tall, making it ideal in a pot, where you can enjoy its beauty even without a garden. The leaves are lime-green, turning powerful reds and oranges in fall. Autumn Moon Japanese Maple – Acer shirasawanum ‘Autumn Moon’ – the normal Japanese maple is not the only maple that grows in Japan. This species is also popular with Japanese gardeners, and those in-the-know in the West too. Known as the Full Moon Maple, it has much more rounded leaves, with 9 broad lobes, deeply divided to the middle of the leaf. The more rounded leaf is like a geisha’s umbrella perhaps, and in fall this variety turns gold, with each leaf darkening to crimson on the ends of the lobes. Absolutely unforgettable! ‘Aconitifolium’ mentioned above is also a Full Moon Maple. Koto no ito Japanese Maple – if you love finely-divided leaves, then you will adore this variety. It has the longest and possibly narrowest lobes of any Japanese Maple – so long you could almost mistake the tree for a bamboo plant. It grows into a narrowly upright tree perhaps 6 feet tall, so it is ideal if you have limited space. In fall its green leaves turn gold and orange, and with its soft grey bark, for delicacy and beauty this tree is unbeatable. With such fine foliage it does take a little extra care, but it is surely worth it.